All Easy Digits addresses will come with a hole pattern, 3/16″ threaded pins, and 1/2″ clear acrylic spacers. 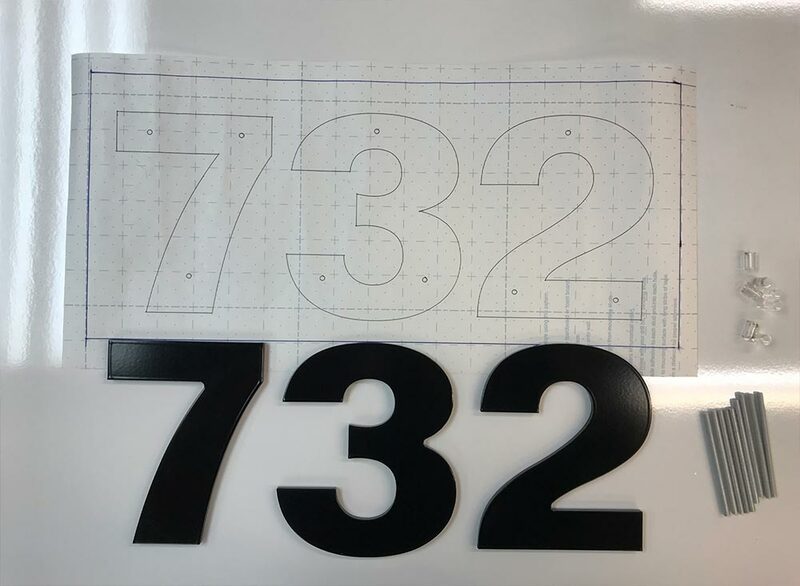 Tape the provided hole template pattern to the location where you wish to have the numbers installed. Use a level on the black box drawn around the numbers to ensure your address is level. DO NOT USE THE BLUE GRID ON THE PAPER. Align the drill with the holes on the pattern. Drill about 3″ deep. The aluminum pins should be cut down if you cannot drill to that depth. Once the holes have been drilled, remove the template, blow out the holes, and insert a small amount of silicon (or construction adhesive) into each hole. Screw the aluminum threaded pins into the back of the numbers. Slide on the 1/2″ spacers if you wish to have the address stood off the wall. Push the numbers into place and you are done!